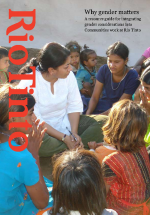 The SMI-Centre for Social Responsibility in Mining (SMI-CSRM) has authored four leading practice guides for Rio Tinto on key social performance issues, including: gender, cultural heritage, human rights and land use agreements. All four guides are available as public documents, reflecting both SMI-CSRM's and Rio Tinto's commitment to sharing pre-competitive knowledge to improve the global mining industry’s performance on these issues. The guides were developed through a collaboration between SMI-CSRM’s staff, a Rio Tinto Internal Working Group, and an External Advisory Group of eminent experts in each topic area. Each guide contains a “How To” section and a “Background Reader” for more detailed information on each topic. The use of case studies from across the Rio Tinto group, ‘break out boxes’ and plain language makes these complex topics accessible for a non-specialist audience. The first guide, "Why Gender Matters", was launched in 2009. The mining industry is male dominated and often 'gender blind' in its interactions with local communities. The guide helps to better integrate gender considerations into mining industry engagement practices. In acknowledging the fundamental role that culture and heritage play in its engagement with local communities, Rio Tinto then commissioned SMI-CSRM to develop the “Why Cultural Heritage Matters” guide. The “Why Human Rights Matters” guide is considered to be a unique document in terms of operationalizing 'respect' for human rights in line with the United Nations (UN) Guiding Principles on Business and Human Rights. The latest guide, "Why Agreements Matter" was launched in July 2016 at Customs House, Brisbane. This guide encourages the use of negotiated agreements as a mechanism for the industry to develop strong relationships with host communities and recognise and respect connections to land, particularly when mining activities take place on or near the lands and territories of indigenous and tribal communities. The guides are built on a core conceptual framework formulated by SMI-CSRM. The framework requires, amongst other things: the development of a comprehensive social knowledge base; a commitment to engagement with internal and external stakeholders; and resources for monitoring and evaluation. Rio Tinto has translated the guides into multiple languages to maximise global reach. These guides have positioned SMI-CSRM at the forefront of social performance thinking in mining, and brought much needed industry attention to these important issues.